December 29, 2010  When a blizzard's coming, there are sure to be stories about folks stocking up on toilet paper. And when the blizzard's over, there are sure to be stories about outrage over unplowed streets and seemingly unprepared state and local governments. 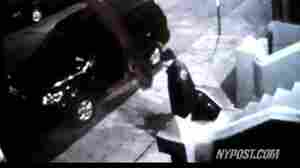 December 23, 2010  Images of a man pulling a suitcase that was found in Harlem early Wednesday with a woman's body stuffed inside were recorded by a surveillance camera. Authorities are hoping someone who sees the video can help solve the crime. December 17, 2010  The fund created to recover money for investors who were defrauded by Bernard Madoff has reached a $7.2 billion settlement with the estate of the fraud's single-largest beneficiary. December 16, 2010  Construction of the "Freedom Tower," or 1 World Trade Center as it is now called, has reached the 52nd of 104 planned floors. The building now stands at more than 600 feet above ground. December 10, 2010  The only United States flag not lost and known to have avoided capture at the Battle of Little Bighorn in southeastern Montana has been sold at auction in New York by Sotheby's for $2.3 million. December 10, 2010  The original rules of basketball were sold at auction Friday in New York City, going for $4.3 million. December 3, 2010  Google is buying the massive office building where it currently rents space in New York City, according to a report by The Wall Street Journal. November 12, 2010  There are now about 1,300 security cameras in Lower and Midtown Manhattan, up from about 450 in June, Bloomberg News reports. Subway Service: A Blessing Or A Curse? August 4, 2010  Look out New Yorkers and tourists in the Big Apple -- the MTA is looking to bring cell phone and WiFi service to the subways. But will opening the electronic floodgates underground do more harmthan good? May 11, 2009  Homeless in New York? Better pay up, New York City restarted a policy of charging homeless families to stay in public run shelters.